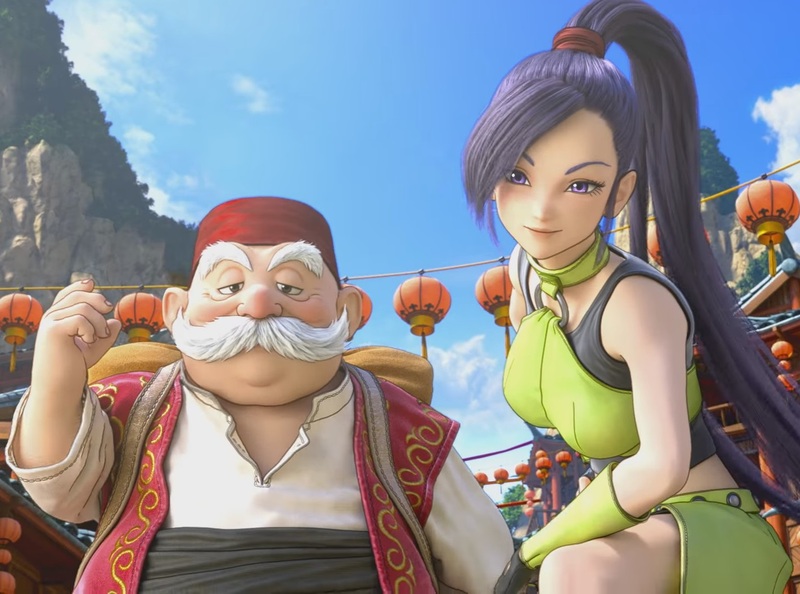 Recently I had the opportunity to get a couple of solid hours in to the English version of Dragon Quest XI. I got to noodle around the very start of the game, and then play a bit more a few hours down the track after I'd formed a complete party of heroes. I came away very, very... very impressed. The defining moment across the two parts of the game that I got to play was one of the early wilderness areas. There I was riding my trusty horse around, bopping the standard blue slimes that Dragon Quest first level heroes get to take on. It just wouldn't be Dragon Quest without them. I then entered a cave area, rode around a little more, before emerging to witness a massive castle constructed on the edge of an even more massive ravine that I was on the other side of. The castle was so large in the way it filled the screen that it was beyond belief, and yet it was so far away that it felt like it would be a journey in itself just to get there. And then I realised that that was indeed my destination. That's when it struck me. More than any other JRPG I've ever played, Dragon Quest XI has an almost intimidating sense of sheer scale. All Dragon Quest games are large, of course, but they're large in such a way that it only needs to render relatively small parts of it at a time. Dragon Quest feels very uninhibited in that way, and the scale of the vistas, as well as the promise of the adventure they offer, is both exciting, and enough to make you very grateful that you have that horse with you. I'm also so impressed that Square Enix has resisted its usual inclination to try and modernise everything it does. 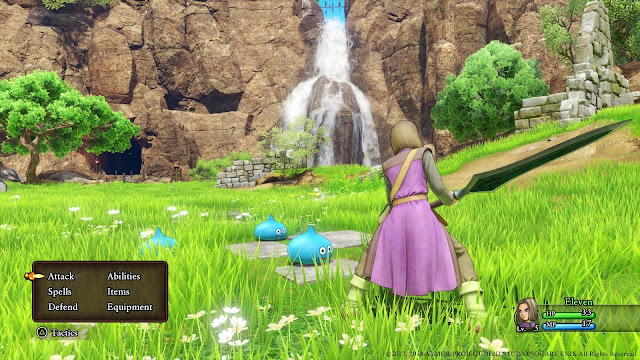 Where Final Fantasy XV only just barely held its Final Fantasy roots together, Dragon Quest feels gloriously nostalgic to play. Akira Toriyama's character designs look exactly like they did right back on the original NES. Now they're just gorgeously detailed in their bold charm. Combat is deliciously turn based and stubbornly traditional in tone. If you've played a Dragon Quest game before, you've played this one. Spells are named the same - Sizz and Fizz and all that good stuff. Enemies, too, have their traditional names, filled with puns and wordplay. This kind of ultra-traditional action is, these days, relegated to budget examples of the JRPG genre. Atelier - bless its pure, innocent heart - has a traditional turn-based combat system because you just know Gust hasn't got the budget to change it. Meanwhile, those JRPGs that have got budgets and were previously either turn based, or at least strategic their slowness, slowly slide towards a very pacey kind of action. I'm not just talking about Final Fantasy here. Look at how much more action-orientate the Tales franchise has become, for example. Even Ni No Kuni managed to make the shift between slow-paced Pokemon-like action to a near button masher across just two games. 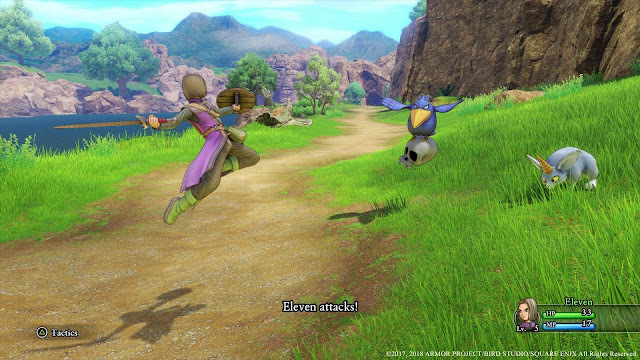 And yet, as completely traditional as it is to play Dragon Quest XI, it doesn't look like budget game on any level. There's a fabulous eye for detail - enemies that you're not in combat with will continue to bounce around in the background even while you're in battle with a different mob, meaning that, unlike every Dragon Quest title previous, the battle arenas are not a distinct area that the game renders separately to the game world. I've already mentioned the sense of scale and the bold art style, but there's plenty of quality of life enhancements too, such as bonfires that you can rest and save at and that are paced out very reasonably (yes, insert Dark Souls joke here). No more need to run all the way back to the previous town you holed up at every time you needed to heal your team or take a break. And the bosses are truly impressive in scale. Or, at least, the one boss I got to fight was. He's early enough in the game that I suspect the rest of the bosses also follow suit. And then there's the detail in the character personalities themselves. Each character I encountered was voiced to a very high standard, and displayed little quirks and tics that had me smiling from start to finish. Dragon Quest has always been great at blending humour and adventure, but as much as I love the series I can't say many of the characters have been particularly memorable. I'm already intrigued by each of the cast members I've come across so far. I can't see this game selling particularly well in the west. Not just because it's from a series that hasn't ever sold particularly well (at least, until Dragon Quest Heroes and Builders came along). No. Dragon Quest XI's biggest problem is that it looks like the most expressive, detailed, "blockbuster" JRPG that we've seen this side of Final Fantasy XV, but with its super-cute visuals, and highly traditional gameplay, you just watch as critics and consumers alike chalk this one up as a game that's out of touch. Meanwhile, if the rest of the game meets the standards of the hour or so I got to play, you can look forward to an astronomical score from DDNet. We do love being different.